This 380 Auto cartridge by Speer will give your compact everyday carry the terminal performance you need to quickly neutralize any threat to your well-being. 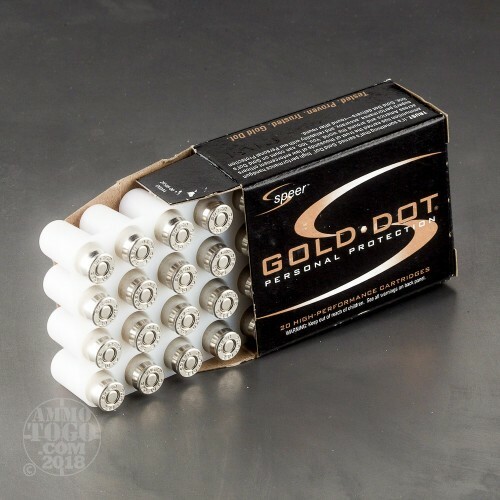 The round’s 90 grain Gold Dot projectile has a hollow point that has been carefully formed over the course of two stages. The first controls the width that the bullet can expand to, while the second controls the rate at which it can expand. The result is intensely reliable mushrooming that you confidently stake your safety on. 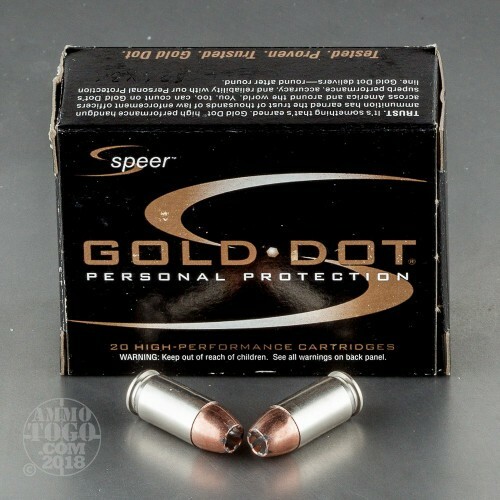 Speer applies a Gold Dot bullet’s jacket to its lead alloy core with their proprietary Uni-Cor process. Because the jacket is formed electrochemically, one single molecule at a time, it is extremely concentric throughout. That grants it the rotational stability which straight shooting depends on. As its core and jacket are basically inseparable, this is a bullet that retains virtually 100 percent of its weight as it expands as well. This round’s new production brass casing wears nickel plating. 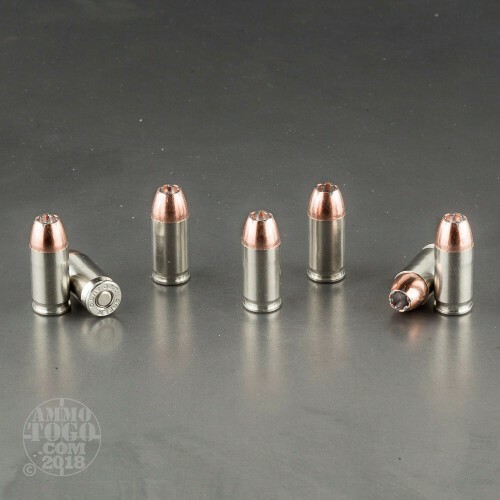 The enhanced lubricity nickel provides makes this round feed and eject without issue in a semi-automatic weapon, and additionally protects the round against corrosion. We shot five of these Speer rounds through a four-layer cloth barrier using a Ruger LCPII. The results are detailed in the video you see above as well as the photographs. 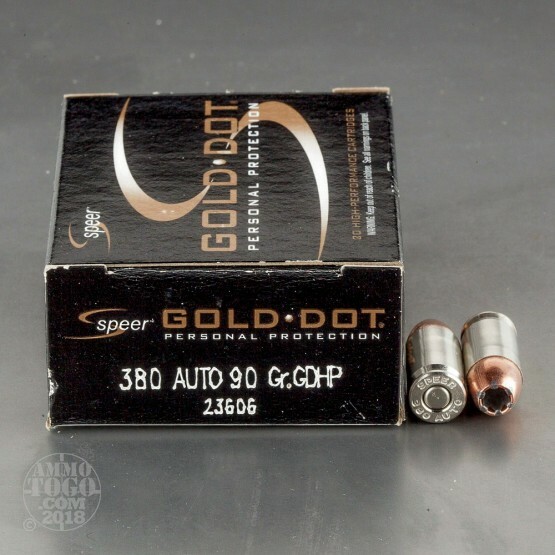 Through the charts, you should get a great idea how this Speer ammo stacked up relative to other 380 Auto (ACP) ammo products available to American shooters. 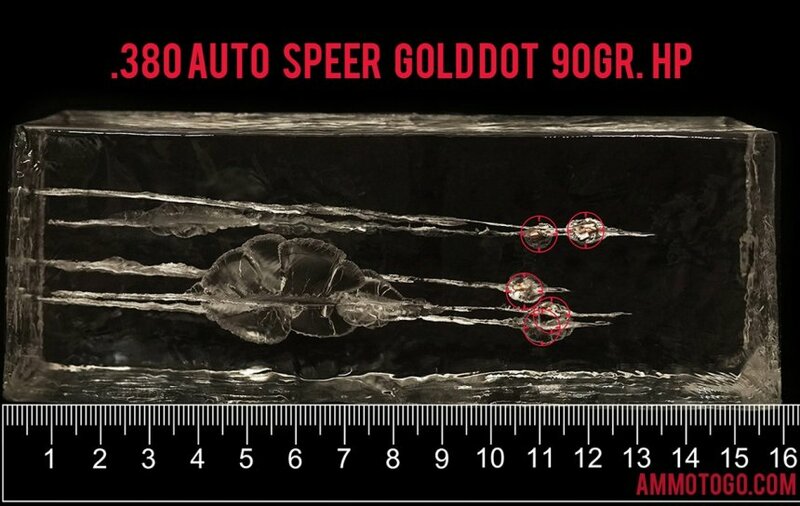 How do the results for this Speer 380 Auto (ACP) compare to other 380 AUTO? Penetration Depth Compared to 380 Auto (ACP) Tested 0" 10" 20" 30" MIN 6.5" MEDIAN 13.3" THIS AMMO 11.5" MAX 28.7"
Personally tested this round from the Glock 42 using 10% ClearBallistic gel following the protocols set forth by Marshall and Sanow in their book, Handgun Stopping Power. Test distance 10 feet temperature 44 F. The bare gel test was a failure. The bullet expanded, but only penetrated a distance of 9.35 inches. Well short of the minimum of 11 required by Marshall and Sanow. 11 inches is the minimum because rounds will penetrate on average 15-20 % further in living tissue than in 10% gel, and comparing with the autopsy reports, Marshall and Sanow figured 11 inches is the minimum required to help assure a hit to the vitals, especially if the bullet must first pass through an arm from an angled shot. Thus, this round was not tested in denim due to bare gel test failure. Not recommended.